TOWCESTER TAXI AIRPORT TRANSFERS 01908 263263 RELIABLE ROAD TAXI TRANSPORT: LCDC letter, sent out to Lord Chief Justice and Tfl's Howard Carter. LCDC letter, sent out to Lord Chief Justice and Tfl's Howard Carter. I am writing as Chairman of the London Cab Drivers Club (“LCDC”) which is a mutual society that represents many London licensed Hackney Carriage drivers (“black cabs”) in London. On the 18th August a story was published in The Guardian newspaper which was also published online (https://ift.tt/2Moc3Za) which informed their readership that the Chief Magistrate, District Judge Emma Arbuthnot, was “stepping aside” from hearing further Uber hearings, to avoid any perceived conflict of interest, as a result of her husband, Baron Arbuthnot (Cons: Wanstead & Woodford), being a fee earning “Senior Consultant” (and former Director) of SC Strategy which is known to represent the interests of the Qatar Investment Authority (QIA), which in turn is a major Uber and therefore “ULL” investor. It is clear that between 30th April 2018 when the “ULL” appeal began at Westminster Magistrates Court and the 26th June 2018 when the ruling was delivered, that TFL were not aware of the potential conflict of interest in having the Chief Magistrate determine the issue of “ULL”’s fitness to operate. In this ruling the Chief Magistrate handed “ULL” a 15 month lifeline, without which they would have been unable to run their business in London. Indeed, it is understood that prior to this link having been disclosed by journalists for The Guardian, the Chief Magistrate had already taken a keen interest in “LUL” (and Uber cases), having ruled in favour (again) on another case and having had 5 other cases, which featured “ULL” or Uber issues reserved to herself (including one in Brighton, which after having the conflict pointed out to her, she immediately passed to a fellow Judge). 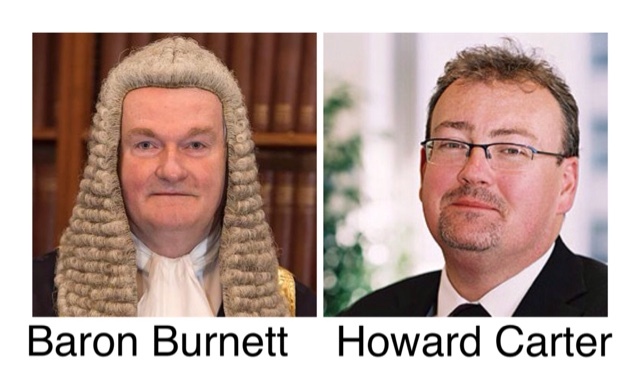 Whilst we are heartened that the Chief Magistrate has clearly formed the view that there is likely to be a perception of impartiality because of her husband’s links to the mysterious SC Strategy Ltd (a company established by Lord Carlile along with Sir John Scarlett in 2012, which invited Baron Arbuthnot to be a Director in January 2017), it is disappointing that a review of her role in the appeal TFL v ULL has not been considered. Unfortunately, Baron Arbuthnot has only been the Director of 4 companies, coincidentally 2 of these he shared a Directorship with Lord Calile; SC Strategy Ltd (01/01/16 – 31/12/17) and Astute Strategy Ltd (which he joined in May 2017). AS Ltd is an active (yet dormant) company. Of the remaining 2 he resigned from Vertic in November 2013 and whilst he remains a Director of Gusbourne PLC, this company manufactures English sparking wine, which is unlikely to be the sort of company where a conflict with her Judicial Office would be found. You may feel that it is worthy of note that in an investigation by the Wall Street Journal on members of the House of Lord’s interests, Lord Carlile said SC Strategy 'are not involved in lobbying at all, nor do we provide services in government relations,' adding 'we give strategic advice to entities and individuals on UK regulatory issues, on the structure and working of government, and how best to place themselves in the UK'. Confirming that Clients include the QIA and on this he says, 'we give advice to a sovereign wealth fund, which of course includes its subsidiaries according to need'. Baron Arbuthnot, is a fee earning Consultant in SC Strategy Ltd (for which he was formerly a Director). SG Strategy Ltd.’s only known client is QIA. QIA is a major investor (perhaps to the tune of more than $1 billion dollars) in Uber/ULL indeed, so major is the investment that it could well be considered a subsidiary of GIA. his wife, who is the Chief Magistrate, apparently unaware of the link to Uber hears the appeal of TFL v ULL. The Appeal is successful and the Chief Magistrate grants an 18 month extension which permits ULL to operate in London (and QIA does not suffer financially). I am sure that you will be aware of the case of R v Sussex Justices, Ex parte McCarthy ( 1 KB 256,  All ER Rep 233) which is a leading case on the impartiality and recusal of Judges is famous for its precedence in establishing the principle that the mere appearance of bias is sufficient to overturn a judicial decision. It also brought into common parlance the oft-quoted aphorism "Not only must Justice be done; it must also be seen to be done”. It is difficult to accept that The Guardian newspaper were the first to bring the connection to the Chief Magistrate with regard to her husbands business interests but that being said, if the mere appearance of bias is sufficient to overturn a judicial decision ought that not to be done in the appeal of TFL v ULL? I very much appreciate your time in reading this letter and look forward to your considered response.